The Princess of Swords is a court card of the ancient element of Air. This element is about the mind and its powers of thinking, reasoning, logic and comprehension. This mind is a powerful instrument as it gauges the scope of one’s reality. It allows in what it can accept and filters out what it cannot believe. It creates the blinders that determines the parameters of our reality. From the Infinite Allness, the mind selects an intersection of time, place and belief and brings to us a version of reality that we can accept. It decides how big or small our world is and all that it will include and exclude. If we expand our minds, we automatically expand our reality. The Princess of Swords is a young woman, curious and intelligent. She is hungry for knowledge. She is feeling the restrictions of her intellectual parameters and wants to expand them. She knows there is much more. She might be found in activities that engage and sharpen the mind such as: reading, thinking, meditating, reflecting, debating, researching, studying, going to school and taking classes. The Princess of Swords can often be spotted as a rebel. She most likely has the T-shirt and bumper sticker that reads, ‘Question Authority’. She is motivated by the simple proddings of a big ‘Why?’. Her spirit is defiant like that of a warrior. She wants to understand the rules of culture and society so that she can break them. She wants to understand the laws of nature so that she can govern them. She wants to understand the beliefs within religion so that she can challenge them. 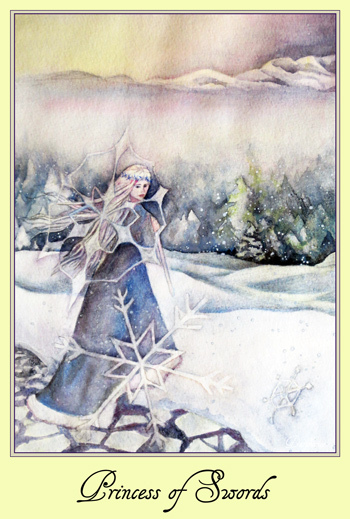 In this card we see a young woman in a frigid landscape. She is moving away from the intelligence of her heart and replacing it with the intelligence of her mind. She is leaving behind a lake which represents her emotional realm. This lake was once warm and sensual but now is cold and frozen. She steps onto the snowy-lands which presents the element of water in a safe and solid form. She will no longer drown in it or be torn by its treacherous currents. In this solid state it is more manageable. She can safely walk on it and analyze its beautiful intricate patterns. The Princess of Swords is still young and at the beginning of her quest. Her mind is still struggling with its limitations. She wears a crown of sharp ice crystals that sometimes break through her delicate skin. Ahead she sees her goal; the high mountain peaks. When she reaches them she will be able to have a higher perspective. She will be able to see the governing patterns and behave from the sane mandates of logic and reason. She must pass through the dense forest ahead which represents her fears and the dark unknowns within her nature. The thick mist represents her mental barriers which restrict her vision. She must sharpen her mind and pierce through its thickness to get to the mountain peaks where she hopes to find profound peace and clarity. When you get this card, question your reality. Stop and look at things logically. You might be trapped in an emotional drama that requires analysis from a different perspective. Learn more. Move out of the emotions and look at the clear facts. With effort and discipline your answers can be known. 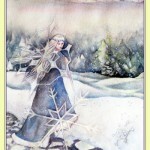 This entry was posted in Swords, Tarot on February 1, 2014 by darshanie.